The Mini Gastric Bypass (MGB), or Single-Anastomosis Gastric Bypass, is a powerful weight loss procedure that is similar to the gastric bypass. This weight loss surgery procedure is quickly growing in popularity, as being one of the safest and most effective forms of bariatric surgery. Here we explain the single-anastomosis gastric bypass surgery in detail. You will learn why Mini Gastric Bypass may be the best option for you as a safe procedure in Tijuana, Mexico. A questionnaire provided by SurveyMonkey yielded the following information. The average BMI before the operation was 46, and the average hospital stay was only 3 days. In 91 percent of patients, diabetes had resolved itself within one year. Experts came to the conclusion that GERD is improved by MGB and fewer ulcers occurred compared to those after RYGB. The %EWL was: one year at 76%, two years at 85%, three years at 78%, four years at 75%0, five years at 70%, longer 70%. In 14% of patients, there was a failure to lose less than 50% of excess weight in 5 years. There has been a 0.2% 30-day mortality rate. The cost of Mini Bypass in the United State and Canada is prohibitive if you are uninsured or underinsured. Mexico Bariatric Center is taking advantage of the medical tourism in Tijuana, Mexico to offer affordable and reliable all-inclusive packages to patients around the world. The mini gastric bypass is similar to the gastric bypass (Roux en Y), and the gastric sleeve (VSG). The gastric sleeve uses restriction only, by removing 80% of the stomach, ultimately having the same “full feeling” and “eating less” like the mini gastric bypass. Gastric sleeve procedure completely removes the stomach instead of keeping it in place as in the mini gastric bypass. There are no changes to the intestine in gastric sleeve as it is in mini-bypass. The gastric bypass has two anastomoses, while the mini gastric bypass only has one. The “new stomach” in mini-bypass is created along the lesser curvature of the patient’s stomach. The mini gastric bypass is also less likely to stretch. In comparison to gastric bypass surgery (RNY), the mini bypass has higher rates of marginal ulceration (MU). Ulcers may cause risks and complications after mini-gastric bypass surgery. A surgeon from Taiwan, Wei-Jei Lee, described a comparison that he made over ten years between the RYGB and the MGB surgeries. He believed that MGB was safer and simpler and that it produced better results when it came to diabetes reduction, GLP-1 elevation, and long-term weight loss. There are two components created by this laparoscopic operation with minimal scarring. The gastric pouch in the shape of a tube is created to cause restriction. The new mini bypass stomach will hold between four to six ounces of food, compared to the old stomach holding 40 ounces of food. The larger section of the stomach that was split from your “new stomach” remains intact to produce digestive fluid. A jejunal bypass that features a single gastrojejunostomy anastomosis is performed. The rerouting leads to a significant reduction in nutrition and fat absorption. The abdominal cavity is filled with CO2 in order to have room to comfortably perform the procedure. Place five trocars (hollow tubes) in your abdomen through small incisions. Insert an endoscopic cutter/stapler as well as other instruments through the trocars. Measure small intestines to become a bypass point (200 cm or longer). The anastomosis is reinforced with sutures. The Normal Digestion Process – In the typical process of digestion, food begins in your mouth, goes down through the esophagus, then reaches your stomach. As the food gathers in your stomach, it combines with acids and enzymes that aid in digestion. The gallbladder (holds bile produced by the liver) and the pancreas also create and release digestive juices to help aid in digestion, which connects to the small intestines through the pylorus. 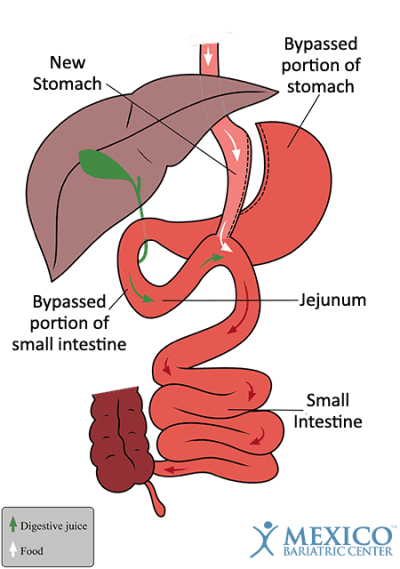 As food breaks down, the particles get released into the first part of the small intestine (duodenum) and continue to the second part of the small intestine (jejunum). Almost all the calories, nutrients, and important enzymes are absorbed within the duodenum and jejunum while most of the leftover particles go through the digestive tract and gets wasted. The New Digestion Process – After the mini gastric bypass surgery, the new stomach will hold significantly less food which creates the feeling of being full. Next, as the food exits the new stomach, it reroutes so it does not go through the duodenum and avoids most of the jejunum. Because of this, fewer calories and nutrients are absorbed, while also having most of the same digestive fluid break down the food particles. The mini gastric bypass surgery has shown itself to be quite useful in resolving Gastro-Esophageal Reflux Disease or GERD. The number of procedures performed has increased dramatically worldwide since it was conceived in the United States 18 years ago by a well-known doctor named Robert Rutledge. In the early stages of the mini gastric bypass surgery, there was a lot of resistance from surgeons who had been performing longer procedures with greater difficulty. The surgeons are finding that this procedure is technically straightforward, rapid, efficient and safe. The process also offers a single anti-colic anastomosis that is in prevailing view, results in less leakage the absence of any leaking issues and a bypassed length that can be modified based on the BMI of the patient. This procedure results in durable weight loss that can be reversed or revised as needed. The surgeon will determine the length that is bypassed based on lifestyle, habits, health, and physical condition. In people who are very tall or especially obese, the surgeon may opt for 250 cm or more rather than the traditional 200 cm distal to the Treitz ligament. Different modifications of this surgery have had different results, and it was found that placing the anastomosis between 200 cm and 300 cm proximal to the body’s ileocecal valve would be ideal for maintaining an adequate level of nutrition. It is possible for the MGB operation to be modified if there is inadequate weight loss or an excess amount of weight loss. This involves moving the anastomosis either proximally or distally. * Prices are subject to change. Not valid on certain dates (blackout dates). Prices depend on the surgeon, surgery, additional fees, and schedule. Prices may rise because of BMI level and previous abdominal surgeries. Last Updated: March 2019, by Ron Elli, Ph.D.